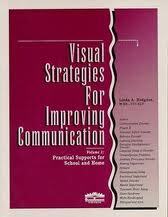 Visual Strategies for Improving Communication: Practical Supports for School & Home by Linda A. Hodgdon. A comprehensive book used to explain the use of visual strategies in order to improve communication for students with autism spectrum disorders and other students who experience moderate to severe communication impairments. It is full of easy to use techniques and strategies that will help these students participate more effectively in social interactions and life routines. Pp. 232. This entry was posted in Communication, Our Library and tagged Autism Spectrum Disorder, books, Communication, visual support. Bookmark the permalink.